I must say…this is one of the best of my creations in the kitchen. New. Favorite. Salad. Zucchini & squash fresh from the garden, leftover BBQ chicken from (?) nights ago, leftover salad dressing from my trip to Chipotle, and throw on some chips. Voilà! 1) half or quarter the zucchini & squash slices. cook them over medium heat in a small omelet pan or nonstick skillet in the olive oil. sprinkle on herbs de provence. stir every few minutes. you know they are done when they start to get a touch of brown. 2) while the veggies are cooking, wash the lettuce & kale. tear into bite sized pieces & put in your salad bowl. 3) chop, dice, or shred the leftover BBQ chicken and sprinkle on lettuce. 4) are your veggies done? spread on top of the chicken. 5) slice the cheese stick horizontally so you have little pieces and spread over veggies. 6) drizzle the salad dressing over your creation. 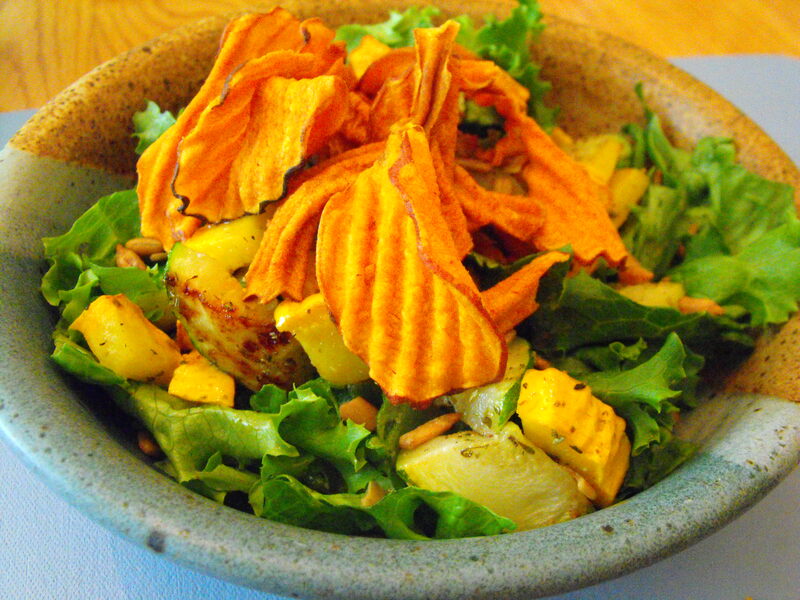 7) sprinkle sunflower seeds and dump a handful of sweet potato chips on top. Previous Love. I still believe in you.